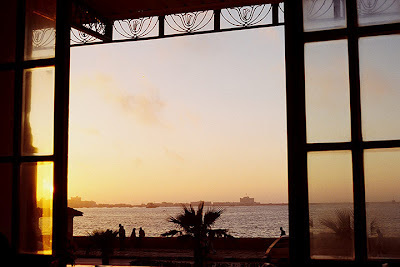 The view from the Athineos Café across Alexandria's Eastern Harbour towards Fort Qayt Bey, built on the site of the ancient Pharos. The Guardian newspaper's Reading Group is immersed in Lawrence Durrell's Alexandria Quartet. There are discussions online and also a gallery of photographs, many of them taken by Michael Haag or from his book Alexandria: City of Memory. To see the Guardian's gallery of photographs relating to The Alexandria Quartet, click here.